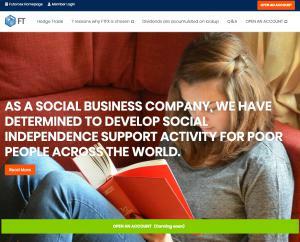 As a social business company, Futuroex has determined to develop social independence support activity for poor people across the world. PANAMA CITY, PANAMA, April 2, 2019 /EINPresswire.com/ -- Futuroex (Representative: Angel Lorenzo, Head office: The Century Tower Bldg. Suite 401, 4th Floor, Ricardo J. Alfaro Ave. Panama City, Panama. https://futuroex.com/ AVISO License Number 1554926), a financial institution in Republic of Panama, starts to provide a new social solution Foreign-Exchange Margin Trading (FX) service "FT (Future Trade)" from April 2nd, 2019（Currently, service is to be prepared for the open account in some countries.). "FT (Future Trade)" is a fully-covered (39 financial institutions worldwide) foreign-exchange margin trading provided in cooperation with a liquidity provider based on management using blockchain technology. With improvement in services to investors and safety as well as utilization of blockchain technology which has not been achieved by the foreign exchange market alone up to now, Futuroex works on the business with an awareness of upward advice from zero-sum by developing new investment products/services while reducing risk of collapsing of margin trading companies. As the company has already obtained registration approval for an electronic trading platform Meta Trader 4, it has made it a rule to manage and operate the platform in a restricted environment in order to provide exchange and remittance services more smoothly. ・Just by depositing money in FX account, customers may entrust operation to the company’s account manager and actual status of buying and selling can be checked on the customer’s own account. It is a new system with secured safety and convenience in which trade (buying and selling) to be performed by an account manager is copied and executed. ・Achieve a clear operating style and develop a fair business by utilizing blockchain technology without an administrator. ・Futuroex is a social business company established with a purpose to eliminate poverty across the world by way of a new financial service. The company pursues the resolution of poverty issue by encouraging entrepreneurship based on independence support (education/account opening) while providing a favorable environment for the transaction. Futuroex is a social business company established with a purpose to eliminate poverty across the world by way of a new financial service. Of approximately 7.3 billion people across the world, about 23% of them is said to be unable to open bank accounts due to poverty and economic reasons. Therefore, many individuals are unable to have an independent social life and a large number of corporations are in difficulty of business operation. Futroex helps social independence of such many poor people by supporting bank account opening. The company also contributes to the foundation of a social business company by supporting independent solo proprietors to open corporate accounts along with their expansion of services. What Futroex intends to achieve in the future is a Securities Exchange platform exclusively for social business companies. The company’s concept will be carried out as a sustainable activity according to the international goal of "SDGs" from 2016 to 2030 adopted at UN Summit which was held in September 2015. ■Address：The Century Tower Bldg. Suite 401, 4th Floor, Ricardo J. Alfaro Ave.